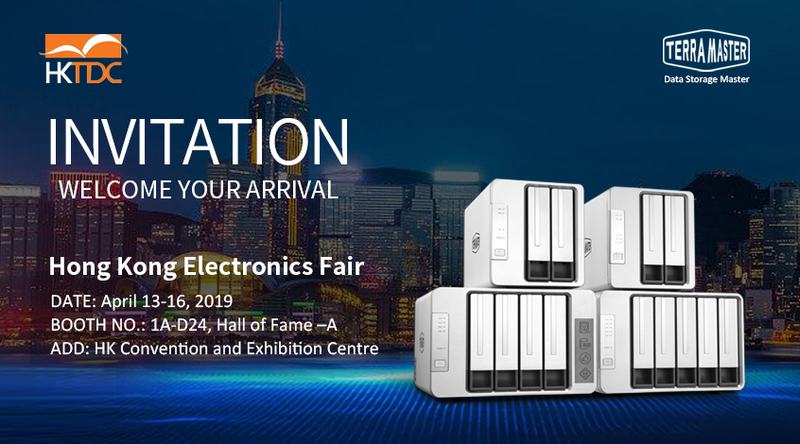 The annual Hong Kong Electronics Fair (Spring Edition) will be held at the Hong Kong Convention from 13 to 16 April. TerraMaster will launch the new Thunderbolt™ 3 and NAS series at the exhibition. At this exhibition, TerraMaster will launch the new D2 Thunderbolt 3, which is one of the representatives of the Thunderbolt series. 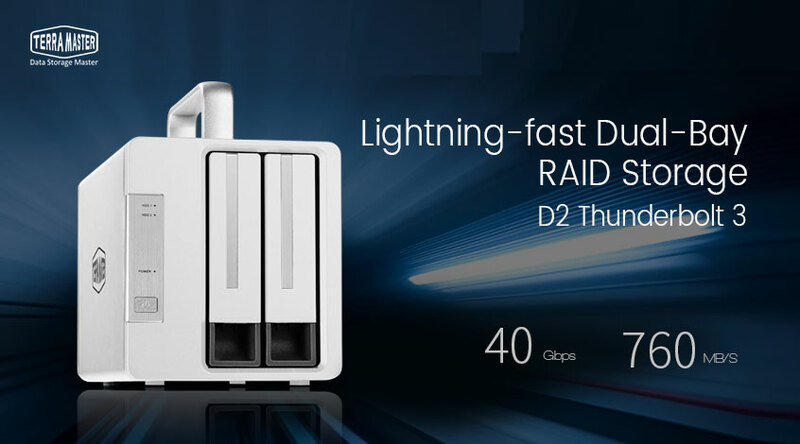 Drawing on a pair of Thunderbold3 interfaces(40Gbps)and a hardware RAID controller, the D2 Thunderrbolt 3 can operate at reading speeds of 760MB/s(SSD×2，RAID0). The speed of the D2 Thunderbolt 3 greatly reduces the time required for almost all tasks in the post-production workflow, and escorts 2K/4k/6k/8k video editing at ultra-fast transmission speeds. TerraMaste also will welcome the new 10Gigabit network NAS at the exhibition. New F5-422 with an Intel quad-core processor, the device’s main frequency reaches up to 1.5 GHz (max turbo to 2.3 GHz). It provides two Gigabit and one 5-speed 10GBASE-T port (10G/5G/2.5G/1G/100M), supports SATA 6Gb/s drives, high-bandwidth connectivity for tackling heavy workloads and smoothly transferring, displaying and editing 4K videos in real-time, and features AES-NI encryption for delivering high performance while also maintaining the security of your data. TerraMaster also has recently launched a new affordable NAS F2-210 cloud network storage device which comes with an ARM V8 64-bit dual-core processor, a frequency of up to 1.4 GHz, and a read/write speed reaching 115 MB/s. Its functions include file storage, data backup, cloud synchronization, remote access, 4K HD video transcoding, and many more. The device is suitable for applications ranging from home multimedia entertainment to small office and home office (SOHO) settings. As an affordable device, the F2-210 is only half the price of a NAS with an Intel x86 quad-core processor. TerraMaster has focused on the development of storage technology for 8 years. TerraMaster continues to explore storage technology and applications, such as how to create more functionality and value to storage products and make storage application easier, more convenient, safer and faster to provide customers with a complete, reliable and trusted data storage solution.Welcome to attend the exhibitition at KongHong Convention and Exhibition Centre in March 13 to 16 at 1A-D24,Hall of Fame-A Booth.